Clement V, given name Bertrand de Gouth, Roman Catholic Pope from 1305 to 1314, was born of a noble Gascon family about 1264. After studying the arts at Toulouse and law at Orleans and Bologna, he became a canon at Bordeaux and then vicar-general to his brother the Archbishop of Lyons, who in 1294 was created cardinal bishop of Albano. Bertrand was made a chaplain to Boniface VIII, who in 1295 nominated him bishop of Cominges (Haute Garonne), and in 1299 translated him to the archbishopric of Bordeaux. Because he attended the synod at Rome in 1302 in the controversy between France and the Pope, he was considered a supporter of Boniface VIII, yet was by no means unfavourably regarded at the French court. At Perugia on the 5th of June 1305 he was chosen to succeed Benedict XI; the cardinals by a vote of ten to five electing one neither an Italian nor a cardinal, in order to end a conclave which had lasted eleven months. The chronicler Villani relates that Bertrand owed his election to a secret agreement with Philip IV, made at St. Jean d'Angély in Saintonge; this may be dismissed as gossip, but it is probable that the future pope had to accept certain conditions laid down by the cardinals. At Bordeaux Bertrand was formally notified of his election and urged to come to Italy; but he caused his coronation to take place at Lyons on the 14th of November 1305. From the beginning Clement V was subservient to French interests. Among his first acts was the creation of nine French cardinals. Early in 1306 he modified or explained away those features of the bulls Clericis Laicos and Unam sanctam which were particularly offensive to the king. Most of the year 1306 he spent at Bordeaux because of ill-health; subsequently he resided at Poitiers and elsewhere, and in March 1309 the entire papal court settled at Avignon, an imperial fief held by the king of Sicily. Thus began the seventy years "Babylonian captivity of the Church." On the 13th of October 1307 came the arrest of all the Knights Templar in France, the breaking of a storm conjured up by royal jealousy and greed. 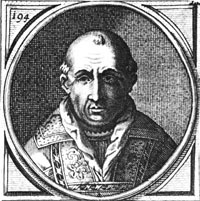 From the very day of Clement's coronation the king had charged the Templars with heresy, immorality and abuses, and the scruples of the weak pope were at length overcome by apprehension lest the State should not wait for the Church, but should proceed independently against the alleged heretics, as well as by the royal threats of pressing the accusation of heresy against the late Boniface VIII. In pursuance of the king's wishes Clement summoned the council of Vienne, which was unable to conclude that the Templars were guilty of heresy. The pope abolished the order, however, as it seemed to be in bad repute and had outlived its usefulness. Its French estates were granted to the Hospitallers, but actually Philip IV held them until his death. In his relations to the Empire Clement was an opportunist. He refused to use his full influence in favor of the candidacy of Charles of Valois, brother of Philip IV, lest France became too powerful; and recognized Henry of Luxemburg, whom his representatives crowned emperor at the Lateran in 1312. When Henry, however, came into conflict with Robert of Naples, Clement supported Robert and threatened the emperor with ban and interdict. But the crisis passed with the unexpected death of Henry, soon followed by that of the pope on the 20th of April 1314 at Roquemaure-sur-Rhône. Though the sale of offices and oppressive taxation which disgraced his pontificate may in part be explained by the desperate condition of the papal finances and by his saving up gold for a crusade, nevertheless he indulged in unbecoming pomp. Showing favoritism towardhis family and his nation, he brought untold disaster on the Church.